Gary Cohn’s departure from the White House won’t end the bull market, at least not yet. The S&P 500 Index stormed back from losses of almost 1 percent to end little changed, as investors heeded a strategy that’s worked more often than not during the nearly nine-year bull run: Buy the dip. This time the rally was sparked by comments from White House officials that suggested the Trump administration isn’t spoiling for a trade war and that key allies may be spared the most severe tariffs. 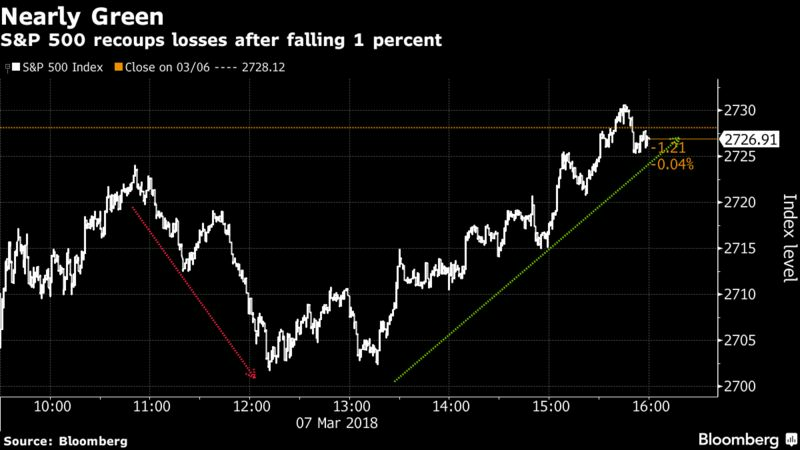 That’s a turnaround from Tuesday evening, when Cohn’s resignation as President Donald Trump’s top economic adviser roiled global markets, sending futures on the S&P 500 to the worst opening print in nearly three years on concern retaliation was imminent. Those initial worries may have been overdone. That view gained currency late Wednesday when White House Council of Economic Advisers Chairman Kevin Hassett indicated the trade policy is not yet finalized. White House spokeswoman Sarah Sanders later said “there are potential carve outs” for Canada and Mexico if the U.S. implements stiff tariffs on steel and aluminum imports. 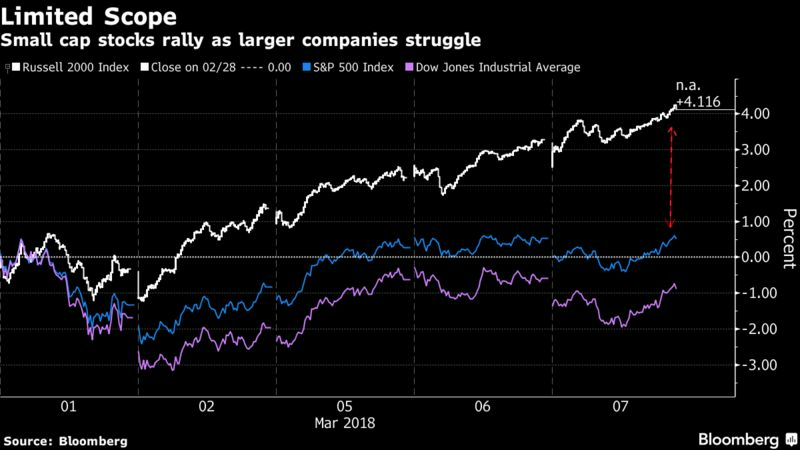 The buy-the-dip mantra is the same one strategists touted earlier this year, as U.S. stocks slumped into the first 10 percent correction in two years. The argument still holds, Harvey says: Fundamentals look good, earnings are strong, and there’s still room for stocks to rise. Stocks spent most of the morning session lower, though at levels well off their overnight lows as investors weighed the likelihood that the Trump administration would follow through on its most protectionist policy plans. The S&P 500 turned higher in afternoon trading, as insiders including Treasury Secretary Steven Mnuchin and Commerce Secretary Wilbur Ross played down the chances the situation would escalate. Mnuchin told Bloomberg News that the “objective is not to create a trade war,” and Ross indicated the administration is open to exempting specific countries from the tariffs. That’s not to say tighter trade restrictions aren’t on investors’ minds. Domestically focused small caps in the Russell 2000 Index rose 0.8 percent, while multinationals in the Dow Jones Industrial Average lost 0.3 percent as investors picked winners and losers based on their exposure to international markets. In the S&P 500, consumer shares fared worst Wednesday, while health-care providers paced gains. Trade worries aside, Schreiber said there’s another reason to be optimistic: buybacks. Last month, Canaccord Genuity strategists noticed a surge in repurchase authorizations, suggesting companies will be at the ready to boost markets on their down days. During the stock market correction, the Goldman Sachs corporate buyback desk experienced its busiest week on record. But even zeroing on trade policy alone, the protectionist policies touted over the past couple days could be more bark than bite, according to Evercore ISI’s Terry Haines. Previous articlePETA Ad Calls For Deporting ‘Undesirable’ Trophy Hunter Donald Trump Jr.
Next articleThis man went viral after falling asleep brushing cats. He’s the hero we need and deserve.